Filming Shakespeare successfully is a bit of a trick, especially if you want to reach an audience who would normally run screaming from the idea of watching a 16th century play in a theatre. Not only do you face the challenge of transferring a work from one medium to another, but of encouraging the audience to see past the artificial language and view the play in a contemporary light. Do you keep the story in its original period, or go for a modern setting? Do you favour fidelity to the text, or do you give yourself license to chop and change scenes and dialogue to keep things moving? Get it wrong, and you have a film like Julie Taymor’s the Tempest (2010), in which actors wander on, do their party piece, and then wander off stage again without any sense of how they are relating to the other characters in the story. Get it right, and you have something like Baz Luhrmann’s version of Romeo + Juliet (1996), a thrillingly modern crowd-pleaser that remains faithful to the source. Ralph Fiennes’ Coriolanus starts out in one school, but slides toward the other. I’d been anticipating something akin to Richard Loncraine’s Nazi-themed version of Richard III (1996) starring, and co-written by, Ian McKellen; in fact, the film does show a Luhrmann influence. It’s easy to see why Coriolanus would attract an actor turned director, with its opportunity for a big central performance, but Fiennes hasn’t picked the easiest of plays to adapt; it offers neither the crowd pleasing fun of the comedies, or the opportunity for the good cathartic cry presented by the end of Romeo and Juliet. Its lead character is also fundamentally unsympathetic: he’s self-absorbed, seems to be constantly cross, and is really only good at fighting. 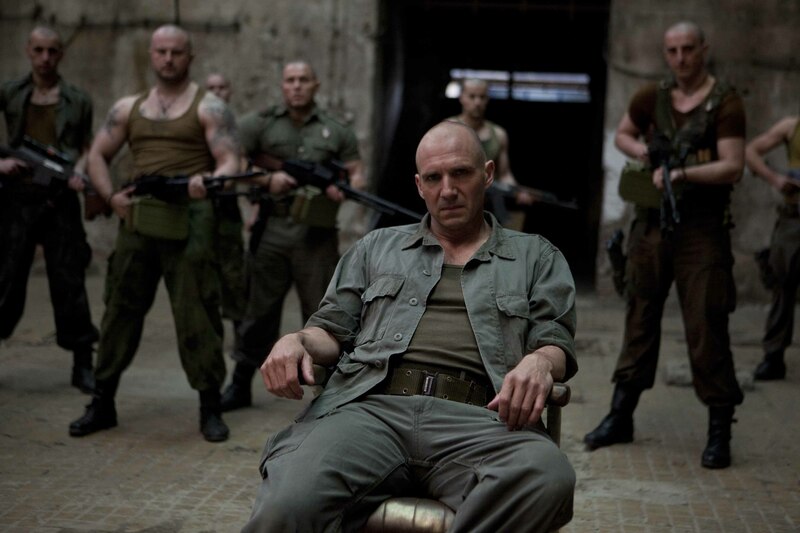 Caius Martius Coriolanus (Fiennes) is a Roman general who has won numerous victories on the battlefield. When he decides to stand as consul, his reluctance to curry favour with the general public means his political enemies can easily portray him as a traitor to the people, and he is hounded out of Rome. Bitter, he plots a bloody comeback. The film is set in the present day, but not any identifiable country. Though we’re told we’re in Rome, it does not resemble the Rome of modern Italy (the film was shot in Serbia). Accents vary: the citizenry is played by local actors, whose Eastern European accents contrast with the RP ones of Fiennes and Vanessa Redgrave. You might assume that this is to illustrate the class divide, but James Nesbitt’s Irish tones seem to dispel that theory. For the first third of the film I thought we were looking at a masterpiece. Characters are introduced swiftly, the background is briskly filled in by extracts from TV news reports, and the battle scenes are excitingly shot in a manner reminiscent of the Hurt Locker (2008) (the films share not only Fiennes, but cinematographer Barry Ackroyd). Several scenes in Act I are cut together, taking us from Martius’ battle against the Volces forces to his family back in Rome. This section culminates in a duel between Martius and his arch-foe, Tullus Aufidius (Gerard Butler). But after that, as the focus shifts to political battles, the pace begins to slow and Fiennes’ inventiveness seems to dry up. A great deal of the second half of the film is shot in close up, or extreme close up. I usually like to sit in the front third of the cinema and get immersed; on this occasion I regretted it, as immersion in Fiennes’ nostrils was not what I had in mind, and I found myself longing for some wider shots just to give my eyes a rest. Ultimately, I was forced to conclude that as a director, Fiennes seems a little heavily influenced by a handful of films and doesn’t bring anything identifiably his own to the film. Though the use of news reports to replace the minor characters is done exceptionally well (there’s a great appearance by a Jon Snow, who manages to make his scene sound both like Shakespeare and like TV news) it’s noticeable that nobody in this modern city uses Twitter, even though mobile phones are much in evidence. There’s no particular shame in that; it is, after all, Fiennes’ first film as director; and as a director of actors, he proves to be first rate. Not only is his own performance excellent (I was only reminded of Voldemort once), most of his co-stars are as well, in particular Vanessa Redgrave as Volumnia. Even Gerard Butler, an actor I swore off after Phantom of the Opera, is tolerable, and the surprisingly large number of people who appear to like him will presumably rate him even more highly. Coriolanus is not one of Shakespeare’s better known works, and it is certainly of more value to have a decent film version of it rather than another Hamlet. I have no doubt that it will be welcomed by Shakespeare buffs and critics. For general cinemagoers though, the wordy second half may well prove to be too much; at the sparsely-attended screening I was at, there were almost twenty walkouts. Uncle Frank writes about film here. Coriolanus is on general release.